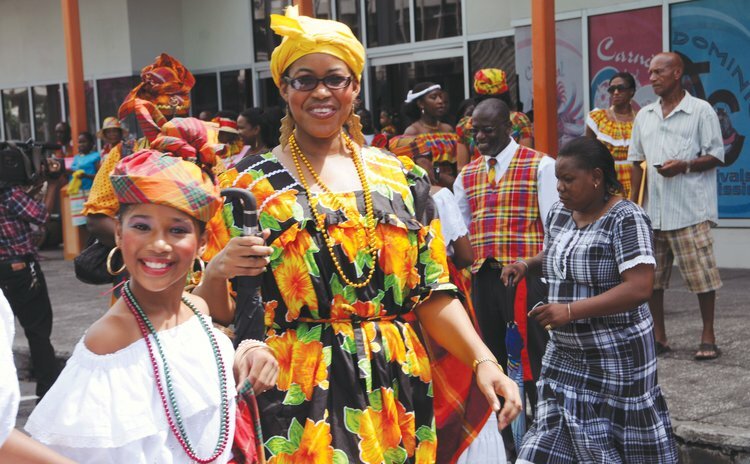 One may have noticed that the traditional National Wear of Dominica is dwindling away. Some People are of the concerned that the National Wear is not being used as it should and has even changed over the years. However, Cultural Projects Officer Gregory Rabess said this is not the case; individuals are simply being creative with the madras cloth and following the line of fashion. "The women we have variations but variations in the line of modern fashion but variations to what we consider the national wear; so the National Wear for women still remains as the Jip or the Dwiyet as they normally are in their original state," Rabess said. "However, the creativity of the new styles using the madras cloth and other African cloth is not necessarily about the national wear, it is about creole fashion, it is about developing the creative industries and the creole cultural industries in the line of fashion. So that is a very positive development, you have to encourage the national wear for men and women but you also have to promote variation and not variation is necessarily the formal National Wear but variation in styles so people need to have the liberty to be creative and our people are very creative". The Wob Dwiyet, referred to also as Gwan Wob or Wob a Gwan Jupon, evolved over the years from the mid 1800's incorporating in its evolution the various cultures which had an impact on the island that is the English, French and African. The Wob Dwiyet is referred to as then Dwiyet. While we may attribute the cut and the fit of the Dwiyet to the dress of the Victorian and Edwardian eras in Europe transported to the island during the colonial period, it is beyond doubt that the color combinations of the Dwiyet and lavish gold accessories were greatly influenced by the Africans brought across to the Atlantic during the slave trade. The concept of the Jip and its evolution must be fully understood before the outfit can be appreciated. This will assist the wearer in dressing properly and carrying the outfit in the appropriate manner. The Jupe-Chemise evolved in Martinique when the town of St Pierre was bustling with activity and economic prosperity. In Dominica, the outfit was never utilized as a status symbol as was the case in Martinique. In fact it was adopted in the twentieth century in its simplest form and is known as the Jip. Women and children used it as a costume during the carnival season, for example Samedi Gras dances and for Monday and Tuesday Jump-Up. Traditionally, Dominicans have worn the Jip for informal events. Today the Jip is worn mainly during the National Independence Celebrations and when the traditional dances are performed. The Jip Outfit comprises the following: Chimiz, Jipon dental, Jip, Foula, Headpiece and Accessories. Traditionally, the male outfit worn in Dominica was the same as that of the colonials that is white long sleeved shirt, jacket, waistcoat, hat, cane, etc. Accessories included a gold watch suspended from a gold chain. Gold cuff links and gold tie pin. Typically, the male outfit evolved at a much slower rate compared to that of the creole women. As formalities became less strict with the passage of time, the male outfit lost some of its layers and dwindled to a white shirt, black trousers, red sash or cummerband and or bowtie and black shoes and socks.